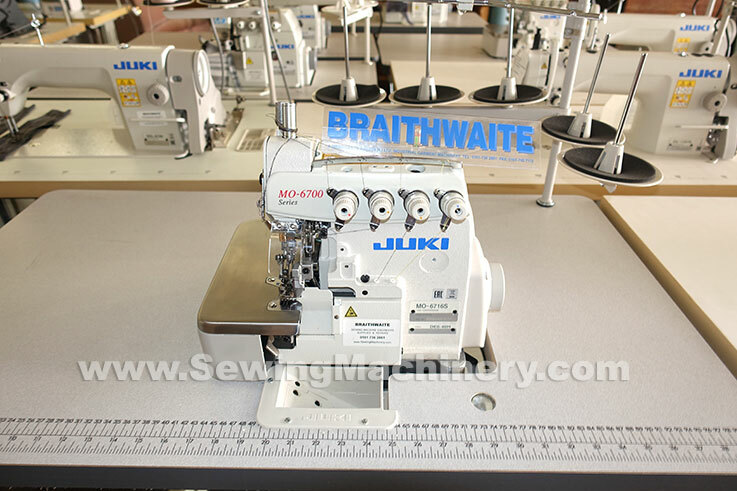 Juki MO6716S 5 thread high speed twin needle industrial overlock sewing machine including unit stand, table, heavy duty motor, makers accessories & instructions. The machine ensures a good quality seam at higher speeds and includes an independent safety stitch running parallel with the overlock edge stitch. The Juki MO-6716S overlocker comes with a needle-thread take-up mechanism and a looper thread take-up mechanism; which offer improved responsiveness on various weights of materials. A lower applied tension achieves soft feeling seams that flexibly relate to the elasticity of the material. Maximum sewing speed of MO6700S series is 7,000rpm subject to model, materials and sewing thread capabilities.